A few days ago, the Diotima Quartet played the 2nd of their 3 concerts including all of Bartók Quartets and Schubert last 3. 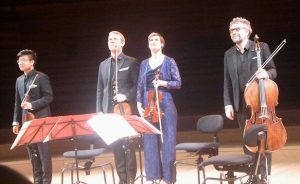 In April 2017, they had realized a tour de force, playing all 6 Bartók Quartets during the same evening. In a more usual approach, they are playing them over 3 concerts. What is a bit more unusual is their choice to couple them with Schubert late Quartets – many string quartets choose Mozart, Haydn, Beethoven, or sometimes the 2nd Viennese school (it is quite interesting to confront the Hungarian masterpieces with Berg, Webern or Schoenberg works). At the last minute, the Diotimas decided to change the order of the pieces, and play both Bartók before the intermission, the Schubert after. So Bartók 5th Quartet was played first: it is built in the arch form dear to the Magyar master – a central Scherzo between 2 slow movements, these being surrounded by 2 fast movements. Both the Adagio molto, Andante and Finale were particularly well executed and extremely enjoyable. Next was Bartók 3rd Quartet, the most condensed of the series, the closest to the Viennese school. The Diotimas served this intense masterpiece to perfection. 3rd masterwork after the pause: Schubert 14th Quartet, “Death and the Maiden“, as its slow movement with variations is based on the lied composed by Schubert a couple of years before. 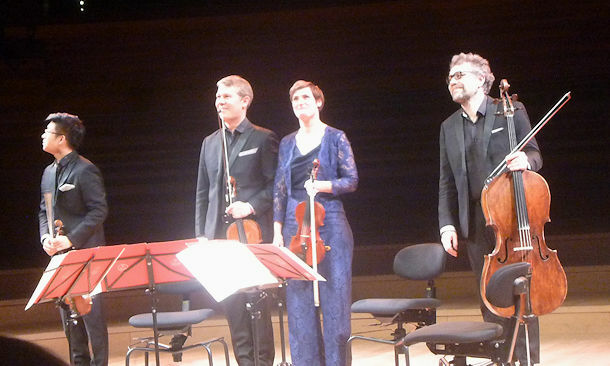 The Diotima Quartet succeeded in conveying all the tension and drama of this jewel in D minor. This entry was posted in Classical concert and tagged Diotima Quartet by MichelE. Bookmark the permalink.